Fitter Feet for Life is one of the most comprehensive centres for the treatment of foot disorders in London. It was established in 1986 to serve clients who were local to our premises in Clapham. Our patients now travel from many other UK locations, and from abroad, in order to have their foot problems or posture accessed and treated. We diagnose and treat both simple problems and complex disorders. The centre offers access to several levels of care. You do not need a referral. When you telephone for an appointment our reception staff will advise you which appointment type to arrange. Our Foot Surgery department uses advanced corrective surgery techniques to stabilise and reposition many different types of foot deformities. A thorough gait investigation is performed prior to surgery in order to establish the cause of deformities and to assess the effect that surgery may have on the foot. Your gait is examined by several methods to give a complete picture. Our Gait Laboratory was one of the first to be created in the UK. It is used to assess how people move. Our slow motion gait analysis, which is included in your initial consultation, allows us to examine all body parts. Each part can be examined from the side, front rear. Additional diagnostic information is provided by our Gait analysis equipment which measures pressure under the foot, revealing symmetry or asymmetry of movement and the time which each foot part spends touching the ground. The Gait Laboratory assesses a wide range of people, with a large diversity of problems. The department sees children with growing pains or walking anomalies. Adolescent children often attend with heel and knee pains. Many athletes do not use their bodies efficiently due to asymmetry and have repetitive injuries. A detailed gait analysis can lead to an improvement in gait though a variety of treatments. Changes brought about by treatment resolve pains and can prevent their recurrence. 3 Way Filmed Analysis, of walking or running from the back front and side views. Our Podiatrists are trained to provide expert care for foot deformities. They diagnose and provide non-surgical care for many foot and limb problems, deformities and pathologies. Some people are not suitable for surgery due to poor health, or cannot have surgery because they cannot take time from work to recover from surgery. 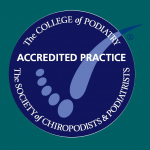 Fitter Feet Podiatrists are experts in relieving foot pain without surgery where possible. Our physical therapy team help you correct your posture after gait analysis. Our Consultant Podiatric Surgeon can prepare medical legal reports for injuries involving impaired foot function and changed posture.